Picture - Luxembourgers celebrating the liberation of their country and welcoming the arrival of Allied soldiers after the Armistice, November 1918. The German occupation of Luxembourg in World War I was the first of two military occupations of the Grand Duchy of Luxembourg by Germany in the twentieth century. From August 1914 until the end of World War I in November 1918, Luxembourg was under full occupation by the German Empire. The German government justified the occupation by citing the need to support their armies in neighbouring France, although many Luxembourgers, contemporary and present, have interpreted German actions otherwise. During this period, Luxembourg was allowed to retain its own government and political system, but all proceedings were overshadowed by the German army's presence. Despite the overbearing distraction of the occupation, the Luxembourgian people attempted to lead their lives as normally as possible. The political parties attempted to focus on other matters, such as the economy, education, and constitutional reform. The domestic political environment was further complicated by the death of Paul Eyschen, who had been Prime Minister for 27 years. With his death came a string of short-lived governments, culminating in rebellion, and constitutional turmoil after the withdrawal of German soldiers. Since the 1867 Treaty of London, Luxembourg had been an explicitly neutral state. The Luxembourg Crisis had seen Prussia thwart France's attempt to purchase the Grand Duchy from the Netherlands. Luxembourg's neutrality was accepted by Prussia's then-Chancellor, Otto von Bismarck, who boasted, "In exchange for the fortress of Luxembourg, we have been compensated by the neutrality of the country, and a guarantee that it shall be maintained in perpetuity." In June 1914, Archduke Franz Ferdinand, heir to the thrones of Austria-Hungary, was assassinated by pan-Slavic nationalists, leading to a sudden deterioration in relations between Austria-Hungary and Serbia. Austria-Hungary was supported by the German Empire, whilst Serbia had the backing of the Russian Empire. On 28 July, Austria-Hungary attacked Serbia, which, in turn, required the mobilisation of Russia, hence of Germany, thanks to its responsibilities under the Dual Alliance. Picture - Under the Schlieffen Plan, Germany sought to bypass the French defences by moving through Luxembourg and Belgium. Anticipating a retaliatory declaration of war from Russia’s closest western ally, France, Germany put into action the Schlieffen Plan. 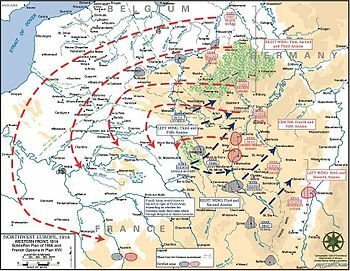 Under this military strategy, formulated by Count Schlieffen in 1905, Germany would launch a lightning attack on France through the poorly-defended Low Countries. This would bypass France’s main defences, arranged to the south. Germany’s army would be able to encircle Paris, force France to surrender, and turn its full attention to the Eastern Front. Since the 1860s, Luxembourgers had been keenly aware of German ambition, and Luxembourg's government was well aware of the implications of the Schlieffen Plan. In 1911, Prime Minister Paul Eyschen commissioned an engineer to evaluate Germany's western railroad network, particularly the likelihood that Germany would occupy Luxembourg to suit its logistical needs for a campaign in France. Moreover, given the strong ethnic and linguistic links between Luxembourg and Germany, it was feared that Germany might seek to annex Luxembourg into its empire. The government of Luxembourg aimed to avoid this by re-affirming the country's neutrality. Picture - Germany's main invasion thrust was towards Luxembourg City. On 1 August 1914, Germany declared war on Russia. On the outbreak of war with its eastern neighbour, Germany put the Schlieffen Plan into action, and Luxembourg's government's fears were realised. Initially, Luxembourg was only a transit point for Albrecht von Wx�rttemberg's Fourth Army. One of the railways from the northern Rhineland into France passed through Troisvierges, in the far north of Luxembourg, and Germany's first infringement of Luxembourg's sovereignty and neutrality was the unauthorised use of Troisvierges station. Eyschen protested, but could do nothing to prevent Germany's incursion. The next day, Germany launched a full invasion. 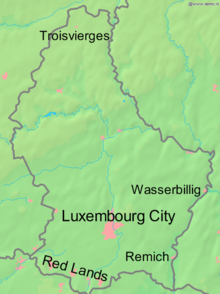 German soldiers began moving through south-eastern Luxembourg, crossing the Moselle River at Remich and Wasserbillig, and headed towards the capital, Luxembourg City. Tens of thousands of German soldiers had been deployed to Luxembourg in those twenty-four hours (although the Grand Duchy's government refuted any precise number that was suggested). Grand Duchess Marie-Ad�lax�de ordered that the Grand Duchy's small army, which numbered under 400, not resist, and, on the afternoon of the 2 August, she and Eyschen met the German commander, Oberst Richard Karl von Tessmar, on Luxembourg City's Adolphe Bridge, the symbol of Luxembourg's modernisation. They protested mildly, but both the young Grand Duchess and her aging statesman accepted German military rule as inevitable. Picture - Theobald von Bethmann Hollweg, German Chancellor. Picture - Eyschen's long premiership had been one of peace and prosperity. Just as the war was in the balance on the Western Front, so the fate of Luxembourg was see-sawing back and forth. It was clear to all that the good conduct of the Luxembourgian government, if fully receptive to the needs of the German military administrators, could guarantee Luxembourg's continued self-government, at least in the short-term. Eyschen was a familiar and overwhelmingly popular leader, and all factions put their utmost faith in his ability to steer Luxembourg through the diplomatic minefield that was occupation. On 4 August 1914, he expelled the French minister in Luxembourg at the request of the German minister, followed by the Belgian minister four days later and the Italian minister when his country entered the war. To the same end, Eyschen refused to speak ill of the German Zollverein, even though he had talked openly of exiting the customs union before the war began. On occasions, Eyschen's principles got the better of him. On 13 October 1914, a Luxembourgian journalist named Karl Dardar was arrested by the German army for publishing anti-German stories. He was then taken to Koblenz, and tried and sentenced by court-martial to three months imprisonment. Eyschen was outraged that the Germans had kidnapped a Luxembourgian citizen and tried him for an extraterritorial offence, and Eyschen did nothing to hide his indignation. Eyschen told the German minister in Luxembourg that the action was a 'direct injury to the Grand Duchy's national sovereignty'. Such vexatious complaints were repeated, by both Eyschen and Victor Thorn, when a railway worker was arrested in January 1915 for allegedly working for French military intelligence, and subsequently tried and sentenced in Trier. As Minister for Justice, Thorn was incensed that the Luxembourgian legal system had been treated with such disdain. Such objections were not received well by the German authorities. Although they tired of Eyschen's stubborn ways, he remained a useful tool to unite the various Luxembourgian political factions. Eyschen was not alone in letting his principles obstruct government business. In the summer of 1915, Eyschen pushed to further reduce the role of the Catholic Church in the state school system. Grand Duchess Marie-Ad�lax�de objected. A fervently religious Catholic (as was most of the country, but not her late father, who was Protestant), she was reputed to have said, "I will not allow their most precious heritage [Roman Catholicism] to be stolen while I have the key." Marie-Ad�lax�de refused to budge, inviting Eyschen to resign if he could not accept her decision. Eyschen nearly did, but decided to control himself. Nevertheless, he would not be long in the job. Picture - The outpouring of national grief at Eyschen's funeral was evidence of the nation's debt to him. His death in office led to three years of political upheaval. On 11 October 1915, Luxembourg's political system was brought to its knees by the death of Paul Eyschen. When war broke out, Eyschen had been 73 years old, but his premiership of twenty-seven years was the only government that most Luxembourgers had known. Throughout the first year of German occupation, he had been a rock for the Luxembourgian people. He had also been of great importance to Marie-Ad�lax�de; the Grand Duchess had never been groomed for the position, was fifty-three years Eyschen's junior, and was considered both politically nax�ve and dangerously partisan for a constitutional monarch. The recent strains were relatively cosmetic. Critically, Eyschen had the confidence of the Chamber of Deputies, and he had managed to hold together a government containing all major factions, seemingly by force of personality alone. To make matters worse for national unity, the strain of occupation had broken apart the pre-war anti-clericalist alliance between the socialist and the liberal factions, thus depriving both the clericalists and anti-clericalists of a legislative majority. The Catholic conservatives formed the largest bloc, but they were least likely to form a majority coalition. The day after Eyschen's death, Grand Duchess Marie-Ad�lax�de invited Mathias Mongenast, who had been Minister for Finance since 1882, to form a minority government. Mongenast's special status as a 'caretaker' Prime Minister is underlined by his official title; he was not 'President of the Government', as all other Prime Ministers since 1857 had been, but held the lesser title of 'President of the Council'. Mongenast's administration was never intended to be long-lived, and Marie-Ad�lax�de's main objective when appointing the experienced Mongenast was to steady the ship. Nevertheless, nobody expected the government to fall as soon as it did. On 4 November 1915, Mongenast nominated a new candidate for head of Luxembourg's �cole normale. The nomination did not meet with Grand Ducal approval, and Marie-Ad�lax�de rejected him. Mongenast persisted; education had been a hobby horse of his, and he imagined that the Grand Duchess would accept the advice of a minister as experienced as he was. He was wrong; the Grand Duchess had always been single-minded, and resented a minority Prime Minister, particularly one so new to the job, making demands of her. The next day, Mongenast resigned, just twenty-five days after being given the job. Having fought with Mongenast, the Grand Duchess decided to appoint an all-conservative cabinet. The Chamber of Deputies was steadfastly opposed; the Party of the Right held only 20 seats out of 52, but they formed the plurality. Marie-Ad�lax�de sought to end this deadlock by dissolving the Chamber of Deputies and by calling for the voters to grant a mandate to the conservatives. This outraged the left, which assumed that its deputies alone had the constitutional right to grant the government confidence; it was dubbed by those on the left a 'coup d'�tat by the Grand Duchess'. Nonetheless, on 23 December 1915, Luxembourg went to the polls. Although the position of the Party of the Right was improved, taking 25 seats, it fell a whisker short of winning an absolute majority. 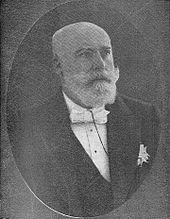 On 11 January 1916, the Chamber of Deputies passed a motion of no confidence, and Loutsch resigned. After the failure of the all-conservative government, the Grand Duchess turned to the leading liberal politician, Victor Thorn, to form a new government. After Eyschen's premiership of 27 years, two governments had come and gone in three months, and the Luxembourgian people were becoming disillusioned with the failure of the politicians. Thorn's nature was to be a conciliatory leader, and he made a direct appeal to the Chamber of Deputies to support his government, no matter the deputies' individual ideological persuasions: "If you want a government that acts, and is capable of acting, it is imperative that all parties support this government." This support was forthcoming from all parties, but only on the condition that each was invited into the government; Thorn was left with no choice but to afford them this. The resulting grand coalition cabinet included every leading light in Luxembourgian politics; besides Thorn himself, there were the conservatives L�on Kauffmann and Antoine Lefort, the socialist leader Dr Michel Welter, and the liberal L�on Moutrier. The most pressing concern of the Luxembourgian government was that of food supply. The war had made importation of food an impossibility, and the needs of the German occupiers inevitably came before those of the Luxembourgian people. To halt the deteriorating supply of food, Michel Welter, the Director-General for both agriculture and commerce, banned the export of food from Luxembourg. Furthermore, the government introduced rationing and price controls to counteract the soaring demand and to make food more affordable for poorer Luxembourgers. However, the measures did not have the desired effect. Increasing numbers of Luxembourgers turned to the black market, and, to the consternation of the Luxembourgian government, the German army of occupation seemed to do little to help. Moreover, the government accused Germany of aiding the development of the black market by refusing to enforce regulations, and even of smuggling goods themselves. Through 1916, the food crisis deepened, compounded by a poor potato harvest across all of the Low Countries; in neighbouring Belgium, the harvest was between 30% and 40% down on the previous year. Although many Luxembourgers were on near-starvation level dietary intakes, the country managed to avoid famine. In part, this was due to a reduction of German soldiers' dependence upon local food sources, instead relying on imports from Germany. Despite the avoidance of a famine, the Luxembourgian government lost much of the faith placed in it by the public and by the politicians. On 22 December 1916, Michel Welter, the minister responsible, was censured by the Chamber of Deputies, which demanded his resignation. Thorn procrastinated, seeking any option but firing the leader of one of three major parties, but could find none. On 3 January 1917, Welter was fired, and replaced by another socialist, Ernest Leclx�re. 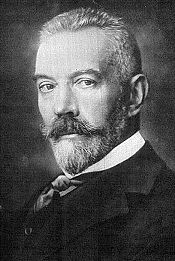 Even after the change and von Tessmar's promise of his soldiers' better conduct in future, L�on Kauffmann was capable of citing thirty-six instances of German soldiers caught smuggling foodstuffs between March 1917 and June 1918. Picture - Von Tessmar's swift suppression of the strike undermined Thorn's government. Discontent amongst the population grew constantly, particularly in the country's industrialised south. The autumn of 1916 had seen the first unionisation within the iron and steel industries, with trade unions springing up in both Luxembourg City and Esch-sur-Alzette. Despite the war demand, iron production had slumped, leading to greater employment insecurity. In March and April, three independents were elected as deputies from the canton of Esch-sur-Alzette, where the economy was dominated by iron and steel. As independents, these newly-elected deputies were the only legislative opposition to the National Union Government. For many Luxembourgers, particularly the miners, expression of disgust at the government could not be directed through the ballot box alone. Sensing the threat of civil disobedience or worse, von Tessmar threatened any individual committing an act of violence (in which he included strike action) with the death penalty. However, on 31 May 1917, the workers sought to use their most potent weapon, by defying von Tessmar's ultimatum and downing tools. Germany was dependent upon Luxembourgian iron, as the British Royal Navy's naval blockade forced Germany to look to accessible local supplies; in 1916, Luxembourg produced over one-seventh of the Zollverein's pig iron. As such, Germany simply could not afford a strike, lest it be deprived of critical raw materials. In putting down the strike, von Tessmar was ruthlessly efficient, but he was not required to resort to the executions that he had threatened. Within nine days, the strike was defeated and the leaders arrested. The two ringleaders were then sentenced by German court-martial in Trier to ten years imprisonment, to the disgust of the government. The continued refusal of the German authorities to respect the Luxembourgian government, and the humiliating manner in which the strike was put down by German military muscle rather than the Luxembourgian gendarmerie, were too much for Thorn. On 19 June 1917, the government resigned. Although the experiment in grand coalition had failed, the need for some political unity remained. As the National Union Government was collapsing, Kauffmann arranged an alliance between his Party of the Right and Moutrier's Liberal League, seeking to achieve change that would outlive the occupation. The primary objective was to address the perennial grievances of the left by amending the constitution; in November 1917, the Chamber of Deputies launched a wide-ranging series of debates on various amendments to the constitutions. Ultimately, the constitution was amended to prohibit the government from entering into secret treaties, to improve deputies' pay (hitherto set at just 5 francs a day), to introduce universal suffrage, and to change the plurality voting system to a proportional one. Whereas all of the above measures were broadly popular, across most of the political spectrum, the same was not true of the proposal to amend Article 32. Said article had not been amended in the overhaul of 1868, and its text had remained unchanged since the original constitution of 1848, stating unequivocally that all sovereignty resided in the person of the Grand Duchess. For some, particularly those that resented the close relations between Marie-Ad�lax�de and the German royalty, the idea of national sovereignty residing in such a person was unacceptable. The Chamber of Deputies voted to review Article 32, but Kauffmann refused to allow it, seeing the redefinition of the source of national sovereignty as covert republicanism. The summer of 1918 saw a dramatic decline in the fortunes of the government. On 8 July, Clausen, in central Luxembourg City, had been bombed by the British Royal Air Force, killing ten civilians. Although this did not endear the Allies to Luxembourgers, the Grand Duchess' instinct was to run to the Germans, who were even less popular amongst the people. On 16 August, German Chancellor Georg von Hertling paid a visit to Luxembourg; although Hertling asked only to see the Grand Duchess, Kauffmann asked that he also attend. To the Luxembourgian people, relations between the two countries now seemed unambiguously cordial, and all that was left of Kauffmann's credibility disappeared. This was compounded further by the news on the 26 August of the engagement of Princess Antonia of Luxembourg to Rupprecht, Crown Prince of Bavaria, who was Generalfeldmarschall in the German army. Pressure mounted on Kauffmann; with his party still strong, but with his personal reputation shattered, he was left with no option but to resign, which he did on 28 September in favour of x�mile Reuter, another conservative. 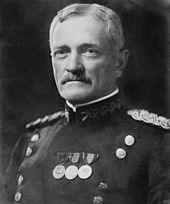 Picture - United States General John Joseph Pershing. By the autumn of 1918, Germany's position in the war was becoming untenable. The massive Spring Offensive had been an unmitigated disaster, whereas the Allied counter-attack, the Hundred Days Offensive, had driven Germany back towards its own borders. On 6 November, von Tessmar announced the full withdrawal of German soldiers from Luxembourg. Five days after von Tessmar's announcement, Germany signed an armistice treaty, which brought an end to the war of four years. One of the terms of the armistice involved the withdrawal of German soldiers from Luxembourg, along with the other occupied countries. After four years of violation of its territory, the Grand Duchy of Luxembourg is to be fortunately liberated. ... American troops enter the Grand Duchy of Luxembourg as friends, and will abide rigorously by international law. Their presence, which will not be extended longer than is absolutely necessary, will not be a burden upon you. The operation of the government and institutions will not be impeded. Your lives and livelihoods will not be disturbed. Your person and your property will be respected. Picture - 1 December 1918 Soldiers from the American 125th Infantry Regiment crossing the Sauer at Echternach, and becoming amongst the first Allied soldiers to enter Germany after the armistice. The following day, American soldiers crossed the Franco-Luxembourgian border. Everywhere, they were fx�ted as liberators, in the spirit that Pershing had intended to inspire, and were met by bands and civilians waving flags, and were adorned with flowers. Luc Housse, the Mayor of Luxembourg City, told the advancing American army that the Germans had, on the whole, been disciplined and well-behaved in the previous three weeks: a marked improvement upon his numerous complaints earlier in the conflict. Finally, on 22 November 1918, the German army completed its withdrawal from Luxembourg, ending its occupation. Germany's defeat created the perfect opportunity for the Allied powers to resolve the Luxembourgian question once and for all. By removing Luxembourg from Germany's sphere of influence, they hoped to guarantee its continued independence, and thus preserve the peace they had won. On 19 December, at the instigation of the British and French governments, the Luxembourgian government announced its withdrawal from the Zollverein and an end to the railway concessions that Luxembourg had previously granted Germany. Although the Allies were satisfied at this remedy, at the time, the Luxembourgian government was threatened by a communist insurgency. After the retreat of the German army, revolutionaries established Russian-influenced Workers' councils across Luxembourg. On 10 November, the day after Karl Liebknecht and Rosa Luxemburg declared a similar 'socialist republic' in Germany, communists in Luxembourg City declared a republic, but it lasted for only a matter of hours. Another revolt took place in Esch-sur-Alzette in the early hours of 11 November, but also failed. The socialists had been fired up by the behaviour of Grand Duchess Marie-Ad�lax�de, whose interventionist and obstructive streak had stymied even Eyschen. On 12 November, socialist and liberal politicians, finding their old commonality on the issue, called for her abdication. A motion in the Chamber of Deputies demanding the abolition of the monarchy was defeated by 21 votes to 19 (with 3 abstentions), but the Chamber did demand the government hold a popular referendum on the issue. Although the left's early attempts at founding a republic had failed, the underlying cause of the resentment had not been addressed, and, as long as Marie-Ad�lax�de was Grand Duchess, the liberals would ally themselves to the socialists in opposition to her. The French government also refused to cooperate with a government led by a so-called 'collaborator'; French Foreign Minister St�phen Pichon called cooperation 'a grave compromise with the enemies of France'. More pressing than either of these troubles, on 9 January, a company of the Luxembourgian army rebelled, declaring itself to be the army of the new republic, with x�mile Servais (the son of Emmanuel Servais) as 'Chairman of the Committee of Public Safety'. However, by January, the vacuum left by the German withdrawal had been filled by American and French soldiers. President of the Chamber Franx�ois Altwies asked French troops to intervene. Eager to put an end to what it perceived to be pro-Belgian revolutions, the French army crushed the would-be revolutionaries. Nonetheless, the disloyalty shown by her own armed forces was too much for Marie-Ad�lax�de, who abdicated in favour of her sister, Charlotte. Belgium, which had hoped to either annex Luxembourg or force it into personal union, grudgingly recognised Charlotte on 13 February. The dynasty's hold on power would be tenuous until September 1919, when a referendum on the future of the Grand Duchy found 77.8% in favour of continued rule by the House of Nassau-Weilburg. Despite the armistice ending the war, and the end of the revolts, Luxembourg's own future was still uncertain. Belgium was one of the countries hit hardest by the war; almost the whole of the country was occupied by Germany, and over 43,000 Belgians, including 30,000 civilians, had died as a result. Belgium sought compensation, and had its eye on any and all of its neighbours; in November 1918, Lord Hardinge, the Permanent Secretary at the Foreign Office, told the Dutch ambassador in London, "The Belgians are on the make, and they want to grab whatever they can." 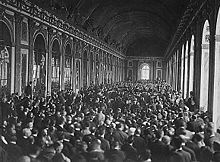 Picture - Delegates signing the Treaty of Versailles, ending the First World War and cementing Luxembourg's independence. From early 1919, Belgium engaged in a propaganda campaign to promote its vision of annexation. At the Paris Peace Conference, the Belgian delegation argued in favour of the international community allowing Belgium to annex Luxembourg. However, fearing loss of influence over the left bank of the Rhine, France rejected Belgium's overtures out of hand, thus guaranteeing Luxembourg's continued independence. The resulting Treaty of Versailles set aside two articles (�40 and �41) to address concerns for Luxembourg's status. The main article, �40, revoked all special privileges that Germany had acquired in Luxembourg, with Germany specifically renouncing advantages gained in the treaties of 1842, 1847, 1865, 1866, February 1867, May 1867, 1871, 1872, and 1902. The effects of these treaties' revocation were then explicitly stated; Luxembourg would withdraw from the Zollverein, Germany would lose its right to use the Luxembourgian railways, and Germany was obligated to recognise the termination of Luxembourg's neutrality, thus validating the actions of the Luxembourgian government since the armistice. Furthermore, to prevent economic embargo after the end of the customs union, the treaty allowed Luxembourg an indefinite option on German coal, and prohibited Germany from levying duty on Luxembourgian exports until 1924. Picture - The Gx�lle Fra monument commemorates the thousands of Luxembourgers that volunteered for service in the armed forces of the Allies. Thousands of Luxembourgers overseas, unconstrained by the Luxembourgian government's need to remain neutral, signed up to serve with foreign armies. 3,700 Luxembourgian nationals served in the French Army, of whom over 2,000 died. As Luxembourg's pre-war population was only 266,000, the loss of life solely in the service of the French army amounted to almost 1% of the entire Luxembourgian population, relatively greater than the totals for many combatant countries (see: World War I casualties). 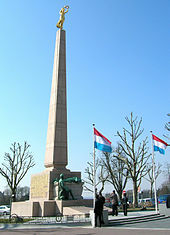 The Luxembourgian volunteers are commemorated by the Gx�lle Fra (literally 'Golden Lady' ) war memorial, which was unveiled in Luxembourg City on 27 May 1923. The original memorial was destroyed on 20 October 1940, during the Nazi occupation, as it symbolised the rejection of German identity and active resistance against Germanisation. After World War II, it was gradually rebuilt, culminating in its second unveiling, on 23 June 1985. The Luxembourgian community in the United States found itself confronted by a crisis of identity. Traditionally, they had identified themselves as ethnically German, rather than as a separate community of their own. As such, they read German language newspapers, attended German schools, and lived amongst German Americans. 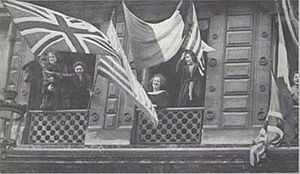 Nonetheless, when it became apparent that the war would not be over quickly, the opinions of Luxembourg Americans changed; on 2 May 1915, the Luxemburger Brotherhood of America's annual convention decided to adopt English as its only official language. Other organisations were less inclined to change their ways; the Luxemburger Gazette opposed President Woodrow Wilson's supposed 'favouritism' towards the United Kingdom as late in the war as 1917. However, when the United States entered the war in April of that year, the wavering members of the community supported the Allies, changing forever the relationship between the German and Luxembourgian communities in the USA. Links to many of the cited primary sources, including speeches, telegrams, and despatches, can be found in the 'References' section. (French)/(German) German occupation of Luxembourg. GWPDA, 21 May 1998. Retrieved on 2006-07-23. Dostert, Paul; Margue, Paul (September 2002) (PDF). The Grand Ducal Family of Luxembourg. Luxembourg City: Service Information et Presse. ISBN 2-87999-018-1. http://www.gouvernement.lu/publications/download/grandducalfamily.pdf. Retrieved 2006-07-23. (German) Faber, Ernest (1932). Luxemburg im Kriege 1914-1918. Mersch id=. (French) Kreins, Jean-Marie (2003). Histoire du Luxembourg (3rd edition ed.). Paris: Presses Universitaires de France. ISBN 978-2-13-053852-3. O'Shaughnessy, Edith (1932). Marie Adelaide - Grand Duchess of Luxemburg, Duchess of Nassau. London: Jonathan Cape. (French) Thewes, Guy (July 2003) (PDF). Les gouvernements du Grand-Duch� de Luxembourg depuis 1848 (x�dition limit�e ed.). Luxembourg City: Service Information et Presse. ISBN 2-87999-118-8. http://www.gouvernement.lu/publications/download/gouvernements_1848_2.pdf. Retrieved 2006-07-23.